Simply gorgeous fantasy floral for Fall !!! 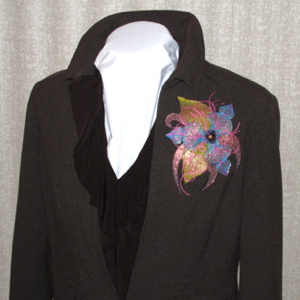 Stylized sophistication for creating that custom couture look! 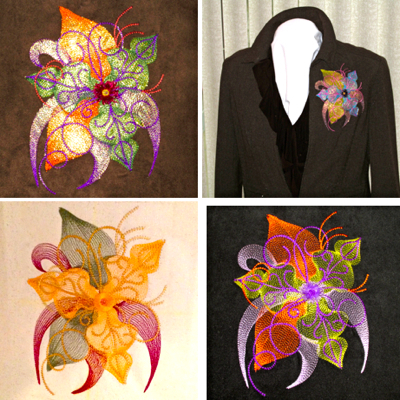 Splash this exotic fantasy flower on your wardrobe for Fall or stitch on home dec accents to compliment your style. 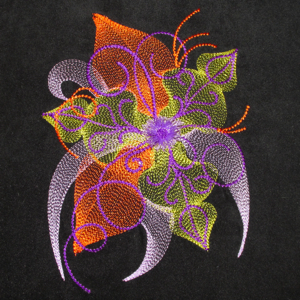 Stitch in colors to contrast or match your fashion or decor for a stunning pop of the colors you want to emphasize. This design also features a done in the hoop fringed center. Photo instructions are included to show you how this is done. Fast, fun, easy!!! 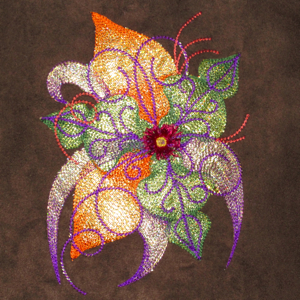 For extra glitz stitch this design with a base of Mylar, Mylar Foils or Angelina Film for an opalescent glow as shown on the brown ultra suede and the jacket photos. Simply gorgeous!